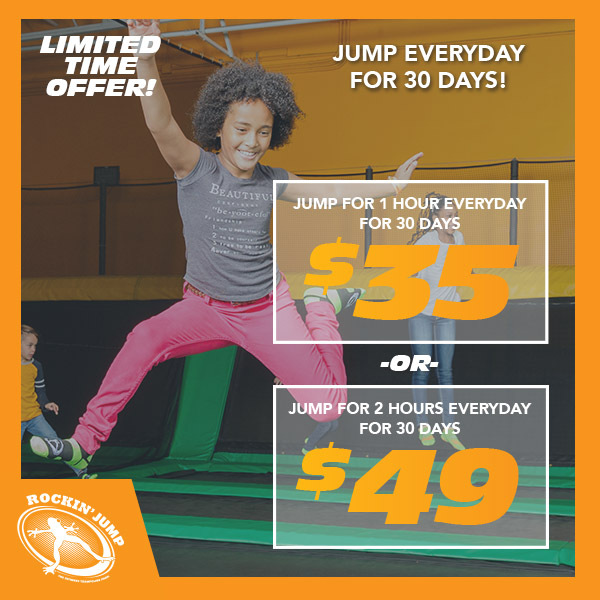 Stretch your dollars further with the Rockin' Jump 30 Day Jump Every Day Pass! This pass allows for one free 60 or 120 minute jump session per day. Pass expires 30 days after date of redemption. Excludes Junior Jumpers, Rockin' Robics and Rockin Saturday events. Socks and signed valid waiver are required. Jump for as little as $1.13 per day ! Soar in open jump arenas, race up our Climbing Wall, play and EPIC game of trampoline dodgeball and do flips and tricks into our incredible stunt bag. Plus jousting, basketball dunking, and a scrumptious full-service pizza café. We also are perfect for birthday parties, school functions, fundraisers and family gatherings, where quality food and private party rooms are guaranteed. Jump Every Day Pass cannot be used for admission to Rockin' Saturday Events. Promotional value does not expire. Once purchased, The 30 Day Pass can be activated at the park.